The flotsamcreated by China'santi-satellite test last month is on the radar screens of space debrisanalysts, as well as space policyexperts. The intentionaldestruction on Jan. 11 of China's Fengyun-1C weather satellite via an anti-satellite(ASAT) device launched by the Chinese has created a mess of fragmentsfluttering through space. Thesatellite's destruction is now being viewed as the most prolific and severe fragmentationin the course of five decades of space operations. 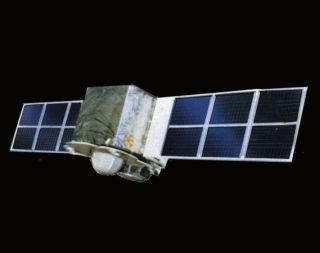 Lobbed intospace atop a ballistic missile, the ASAT destroyed the weather-watching satellite that had been orbiting Earth since May 10, 1999 [image].The result was littering Earth orbit with hundreds upon hundreds of varioussizes of shrapnel. NASA'sOrbital Debris Program Office at the Johnson Space Center is now at liberty todiscuss the characteristics and consequences of the debris cloud created by thefragmentation of the Fengyun-1C spacecraft. As oftoday, the U.S. military's Space Surveillance Network has cataloged nearly 600debris fragments, according to NASA's Nicholas Johnson, Chief Scientist for OrbitalDebris at the space agency's Johnson Space Center in Houston, Texas. However, morethan 300 additional fragments are also being tracked, bringing it to a total ofmore than 900 bits of clutter. "These will be cataloged in due course," Johnsonadded. "The totalcount of tracked objects could go even higher. Based upon the mass of Fengyun-1Cand the conditions of the breakup, the standard NASA model for estimating thenumber of objects greater than 4 inches (10 centimeters) in size predicts atotal about 950 such debris," Johnson advised SPACE.com. Johnsonsaid that the debris cloud extends from less than 125 miles (200 kilometers) tomore than 2,292 miles (3,850 kilometers), encompassing all of low Earth orbit.The majority of the debris have mean altitudes of 528 miles (850 kilometers) orgreater, "which means most will be very long-lived," he said. The numberof smaller orbital debris from this breakup is much higher than the 900-plusbeing tracked. NASA estimates that thenumber of debris larger than 1 centimeter is greater than 35,000 bits ofriff-raff. "Any ofthese debris has the potential for seriously disrupting or terminating themission of operational spacecraft in low Earth orbit," Johnson pointed out. "This satellite breakup represents the most prolific and serious fragmentationin the course of 50 years of space operations," he said. Also put inharm's way by the rain of junk from the Chinese ASAT test is the International SpaceStation (ISS). "Thecollision risk between the Fengyun-1C debris cloud and the International SpaceStation peaked shortly after the breakup and has been declining since. The riskof collisions between ISS and hazardous objects in Earth orbit is now onceagain dominated by the background debris population existing prior to thebreakup of Fengyun-1C," Johnson said. Last year'ssigning by U.S. President George W. Bush of a new U.S.National Space Policy addressed the topic of orbital debris. The documentflagged the progress made both nationally and internationally regarding proliferationof orbital debris over the past decade - but also underscored the worrisomenature of space junk. "Orbitaldebris poses a risk to continued reliable use of space-based services andoperations and to the safety of persons and property in space and on Earth,"the White House document stated. "The United States shall seek to minimize thecreation of orbital debris by government and non-government operations in spacein order to preserve the space environment for future generations." In acollision of coincidences, the 25th meeting of the Inter-Agency Space DebrisCoordination Committee (IADC) is slated for April 23-26 and is hosted by theChina National Space Administration. The meeting is to be held at the ChinaAcademy of Space Technology in Beijing. IADC is aninternational governmental forum for the worldwide coordination of activitiesrelated to the issues of human-made and natural debris in space. Also,reactions spurred by China's ASAT actions are sure to surface later this monthat a meeting of the Scientific and Technical Subcommittee of the United NationsCommittee on the Peaceful Uses of Outer Space in Vienna. On the UNagenda is the potential approval of draft Space Debris Mitigation Guidelinesthat were hammered out last year.